See what I did there?! Now I know that isn’t quite exactly how the song goes that the late and great Janis Joplin sang. I of course like to think I’m funnier than I actually am so had to execute the cheesy (did it again) play on words haha! 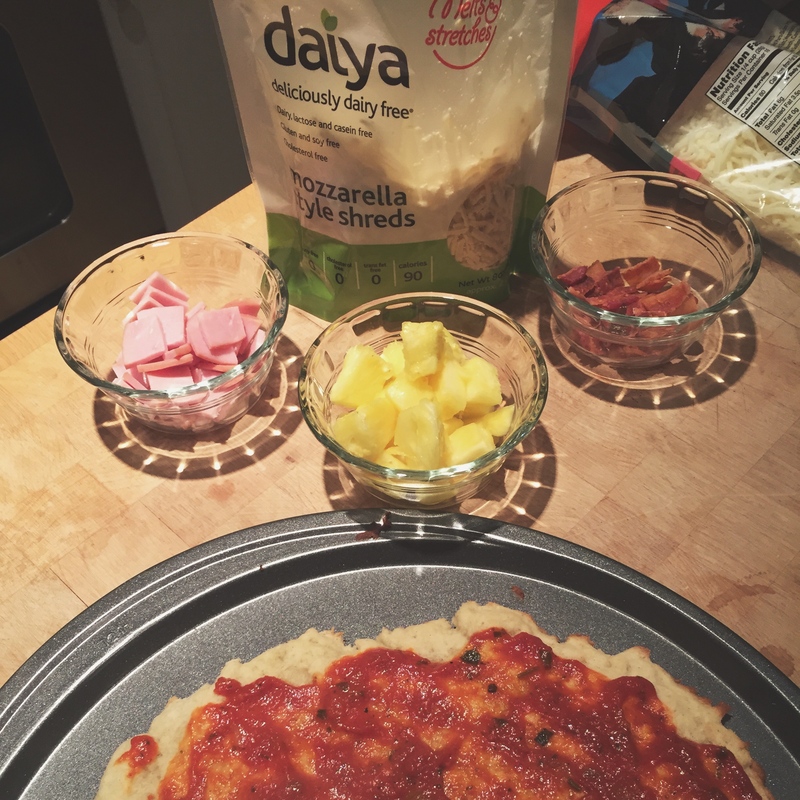 As promised this post is all about me making pizza so that I can eat it and actually enjoy it. And thankfully this time, I can give a truthful response that it was good! I can testify that attempts in the past have not been stellar and Adam will join in on that. Go ahead and note that while I might post a lot of pretty pictures of food in the future I’ll tell you when a recipe was just an utter fail and got thrown out. Let’s just promise to be real with each other okay? Okay good, glad we had that talk. This post may not be as detailed as some will be in the future as I truly had no recipe that I was following besides that of the crust recipe. 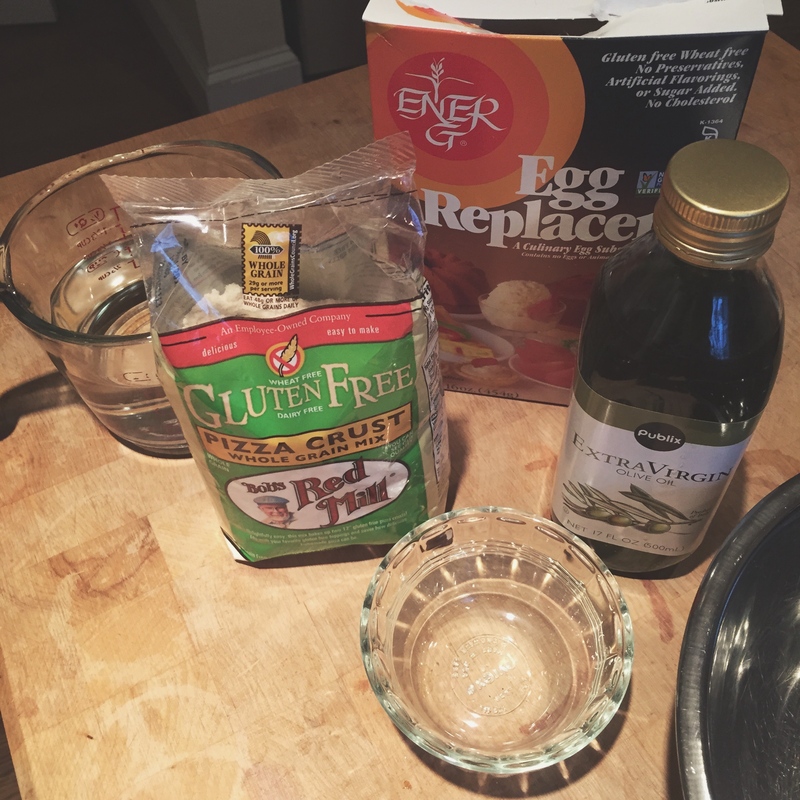 This venture I tried out Bob’s Red Mill Gluten Free Pizza Crust Mix and it was a great choice! If you have a gluten allergy or intolerance, I suggest you become really great friends with these products as they are great! The instructions were pretty easy and as you can see only had a few additional things to add. The mix contained a yeast packet that I had to mix with 1 1/2 cups of warm water and let sit for a few minutes. Meanwhile I had to get the rest of the ingredients ready to mix with the dry ones. Being that I’m intolerant of eggs, you’re probably wondering “Tim, just how do you bake anything because that’s a pretty important aspect?”. Well, guess what I’m going to tell you. 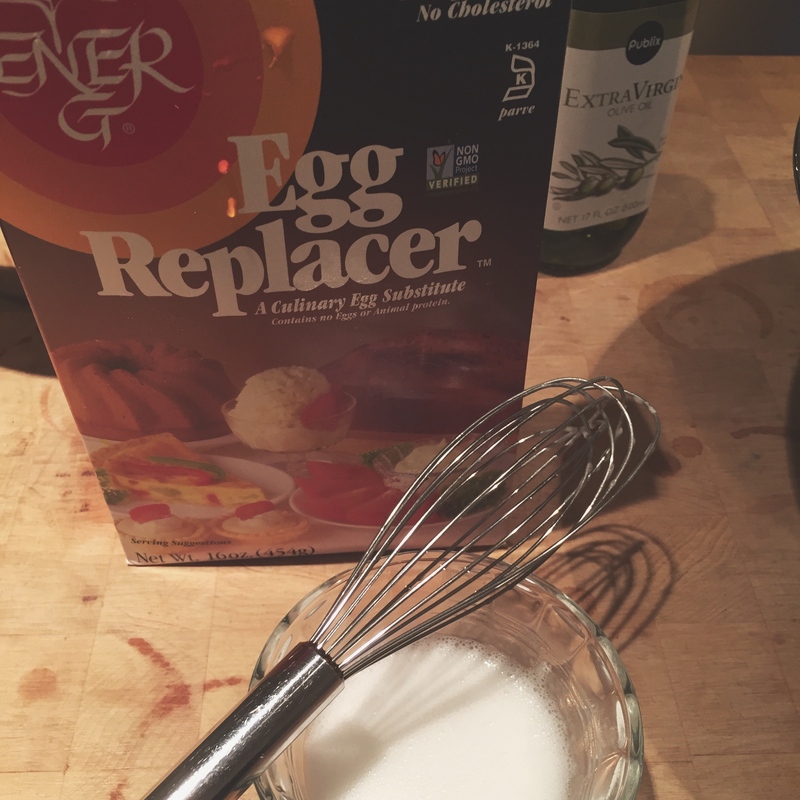 You can see in the upper picture a product from Ener-G called Egg Replacer. It has easily become another one of my best friends in the kitchen. Now you aren’t going to be able to make anything similar to fried or scrambled eggs, but it’s perfect for mixing into things. It’s the consistency of cornstarch, but made out of other products. You simply mix 1 1/2 teaspoons of the powder with warm water and then wisk together to match the amount of one large egg. So easy! I then mixed that, two tablespoons of olive oil, and the yeast mixture all together. Once that was blended, it was then added into the dry mix to begin making the crust. While I didn’t have a handheld mixer or a stand mixer, my hands worked just fine to combine all the ingredients. Then the dough was to be divided and to rest under plastic to rise for about 20 minutes. After that was done, the dough was put on a greased 12″ pizza pan. 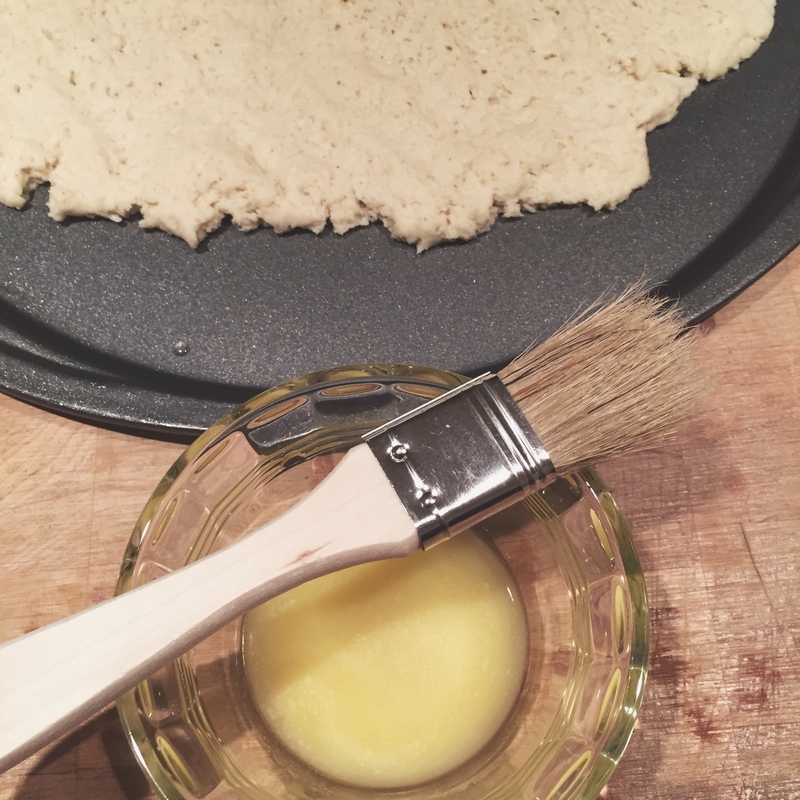 The kicker I think to all gluten free pizza crusts is that you must bake them first (disclaimer: the ones I’ve made before didn’t have that common sense instruction and were therefore not as good). So I brushed it with a little Earth Balance Vegan Butter and let it bake away. After that was done, then to put on the toppings! 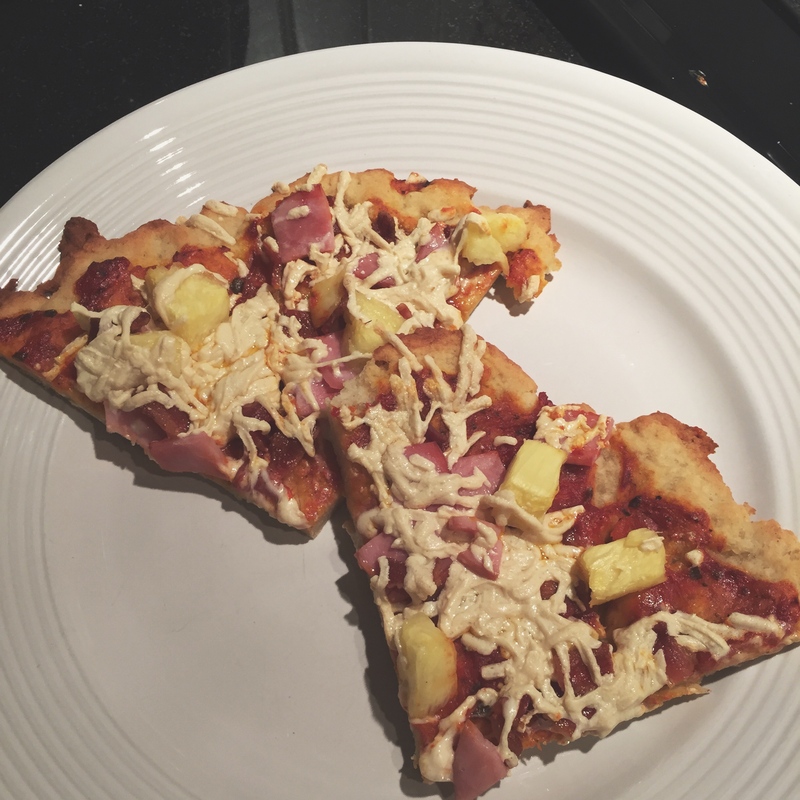 This pizza I opted for was a good ole Hawaiian pizza to help my classic pizza craving. After the crust baked, I spooned out Trader Joe’s Pizza Sauce and then layered Daiya Mozzarella shreds, canadian bacon, pineapple, and a little crumbled bacon. None of that was measured, just prepared by how much I wanted of each! My mouth is watering typing this out and I just ate this again for lunch! The pizza then baked for around 18 minutes and voila it was done! The homemade pizza night was a success! Combined with great company, good wine & re-watching Season 2 of House of Cards to prepare for the premiere on February 27th, I’d say it was a dang good night. Until next time, I leave you with the actual song that brought out the title for this post for your enjoyment! Hey Tim! Loving your blog so far 🙂 Have you tried flax eggs, or chia eggs? I can’t remember the exact proportions, but you can also add those to water for egg replacements, and then use the flax or chia in other stuff for more health benefits. Good luck on your new cooking exploits! Hey Hey! Sorry for the delayed response, but I haven’t heard of those yet so I will have to check them out. Thank you for commenting and checking it out. Hope you are doing well!